Winter is nearing the end in wild horse country. 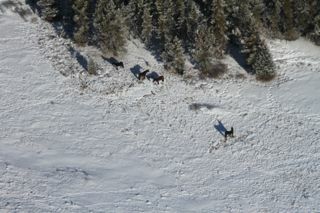 The herds are seeking out the exposed areas where the warmth has melted the snow. 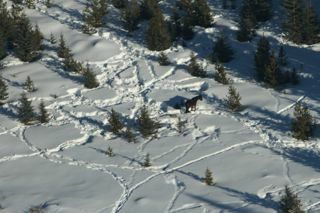 Many of the horses still appear to be in good shape in the areas that we travelled yesterday. We do know that in other areas though, some of the horses are showing the extreme hardships they have had to endure because of the harsh winter and are very gaunt. Soon however, they will start rebounding back as Mother Nature replenishes the rangeland. On March 11th the ESRD stakeholder’s meeting was held in Red Deer. A brief review was given on what had transpired this year in regards to the capture season. We were informed and it is unfortunate that the ASPCA has withdrawn from the committee, even though they state that they did not know about it at the beginning, they also had not attended any of the three previous meetings. Another lost humane voice for the wild horses. Dr. Judith Samson-French, DVM, attended and gave an excellent presentation on a contraceptive initiative that her and WHOAS are willing to institute. She has a 3-year plan that has been thoroughly thought out and backed by excellent research and previous programs from the US. In the US and in many zoos this contraceptive program has proven extremely effective in controlling populations of ungulates and wild horses. This contraception program uses a drug called PZP and can administered without a hands-on approach in its application to the wild horse mares. Even the ability on implementing this to selected mares was outlined to the stakeholders. Information was also presented by a U of Calgary researcher on another drug, Gonacon, which requires an actual hands-on approach to injecting the mares. Both these drugs are actually vaccines and would have no effect on the overall health of the animals that would be treated. After the two presentations a discussion ensued about the practicality and feasibility of implementing this humane population control. Both WHOAS representatives sat there and were taken aback by the complete lack of understanding displayed by stakeholders and the ESRD staff. It became quite obvious that they really do not spend time in wild horse country. The negativity expressed was disheartening with one stakeholder misrepresenting the information that the cost would be over $1,800 per animal, when the real cost would be less than $80. All aspects of this would be undertaken by WHOAS volunteers and followers and Dr. French’s team and there would be no cost to the ESRD and Alberta taxpayers. Why on earth would you not want to adopt a proven and extremely humane strategy for wild horse population control unless there is more going on under the table. What would you think? Another thing that came to light from the ESRD’s statements at this point of the meeting was that they honestly do not have any true information about what effect if any the wild horses do have on the rangeland nor can they state how many horses the environment can sustain. How can you have any management strategy without this information? How can you morally call for the removal of 196 horses in one cull when you do not have this information? 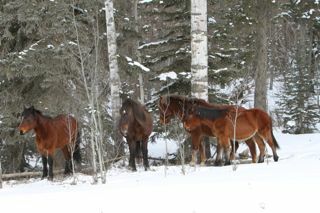 One thing that many do not realize or want to admit is how much of an aesthetic value the wild horses do represent to Alberta. Over the years we have taken so many people out west to share with them the beauty and free spirit that the wild horses represent to us. 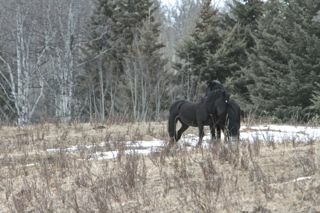 Even this past winter we would pile them in our vehicle and off we go to share our love with these first-time visitors. In every case they came away with a new appreciation and love for how wonderful these animals truly are. Yesterday we took two young women, one who had come all the way from England to have the opportunity to see and spend time with the wild horses. 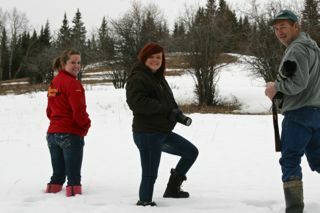 Emily is in the middle with her cousin, Beth, who has only been in Canada a short time. Breaking through this patch of knee deep snow, they soon came to understand how tough the winter had been on the horses. 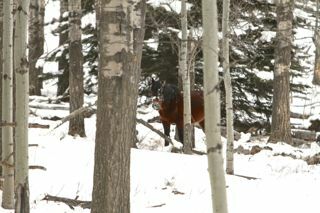 The whole day they were thrilled with the herds of wild horses and other wildlife that we came upon. In this herd in front of them, they even witnessed the stallion letting one of his young male offspring know it was time to leave the herd! As you can see it will soon be time for the young boy on the right to find some other young boys to hang out with and leave the mares alone. We then took them to visit the family WHOAS has rescued that are being kept at a member’s ranch. 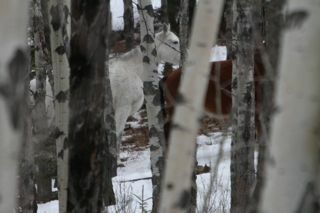 Here they were able to come almost face-to-face to see the true beauty that is in the eyes of these wonderful horses. The gentling process has begun for the three of them which will allow all of them to be adopted out to new forever homes. This process is being done by two of our experienced long-time members who have worked wonders with so many other wildies that have come under our care in the past. The horses are responding well to the excellent care and handling. The mare especially has shown such amazing recuperation. This mare is truly beautiful and has such intelligent eyes and shows a willingness to accept the kindness of humans. Curious, but not afraid, the foal and the young stallion would come up to see what was happening with the mare. Wild horses show an extreme intelligence in their ability to adapt to situations. It will be only a short time in our care before they can be placed in their new homes. Despite these positives, it is not a time for anyone opposed to the ESRD’s capture program to stop contacting the Minister, Robin Campbell. With everything happening within the Redford government, it is also important for you to contact your MLA to let them know how you feel about the method used, since this has proven not to be working and is extremely inhumane. 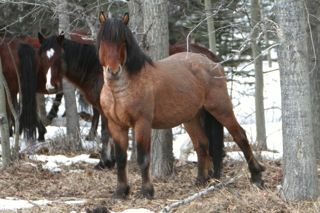 Again there were injured horses, a dead mare, a dead fetus and 3 horses sent to slaughter from this year’s capture. Remember, this was only 12 horses. In our opinion this whole process was a disaster so keep voicing your objections strongly. To find your MLA go to the government website and search for your city or town and your MLA will come up with his/her contact information. Thank you for the report and the feedback. I’m not surprised at the ASPCA’s disgusting lack of action on this issue. They seem to have forgotten what exactly their name stands for. Yes, it’s especially important to keep on pressuring the powers that are in authority over these lands, animals and the wild horses. The ESRD’s complete lack of proper range data is totally unacceptable. As well, the fact of the offer to do the PZP program free of charge, if not enthusiastically embraced, should have been at least been agreed to as a better option. Why is this? Loss of face from the recent anti-cull successes? Government stubbornness and lack of flexibility? We need to find out and address it. I’ve suggested that both Help Alberta Wildies and WHOAS consider putting up a complete list of contacts of all involved politicians and bureaucrats every couple of days. So busy people can have quick access to the info and can act easily and to many on the list. Thanks again! Thank you for the update on the meeting. I would especially like to thank Dr. Judith for all her work.